With Tainted Tokay, authors Jean-Pierre Alaux and Noël Balen have added another delicious gourmet mystery in a series that is quietly gaining an “addicted” following. "Like visiting with old friends—always a pleasure and leaving the anticipation of a next visit. This is a story of wine and mystery, a journey into the lives of the characters and the places." Extremely entertaining, educational, and amusing. Mystery and thriller publisher Le French Book recently released a new Winemaker Detective whodunit. 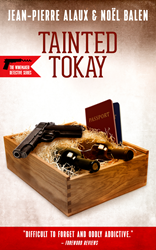 Tainted Tokay is a mystery novel set in Europe. In between experiencing sumptuous food and wine, the Winemaker Detective grapples with deceit and deception in Old World Europe. France’s top wine expert Benjamin Cooker sets off to enjoy the delights of Vienna, a romantic ride down the Danube, a gourmand’s visit to Budapest, and a luxury train through the enchanting Hungarian countryside. All too soon, stolen wallets, disappearing passports, guides who are a bit too obliging, and murder mar the trip. Meanwhile, in Bordeaux, Cooker’s assistant Virgile faces an annoying rival and a mildew crisis in the vineyards just as Cooker’s lab technician is the victim of a mugging. This tasty and wine-flavored story is rich in culinary and oenological stories, sense of place, and contemporary issues affecting Europe. It is for readers who love cozy culinary mysteries, amateur detective stories, international mysteries with French flair, or anything wine or food related. A made-for-TV series, it offers armchair travel at its best with gentle mysteries and characters readers can invest in. Jean-Pierre Alaux and Noël Balen, wine lover and music lover respectively, came up with the idea for The Winemaker Detective series while sharing a meal, with a bottle of Chateau Gaudou 1996, a red wine from Cahors with smooth tannins and a balanced nose. Founded in 2011, Le French Book is an independent book publisher focused on bringing France’s best mysteries and thrillers to new readers across the English-speaking world. For more information, please visit: http://www.lefrenchbook.com. Tainted Tokay is translated by Sally Pane. Available wherever books are sold. ©2016 Le French Book, Inc. All rights reserved. Information is subject to change without notice.